Time Inc.’s decision to reorganize had “nothing to do with digital and one hundred percent to do with the recession.” The reasons for Time Inc.’s reorganization, Moore said, included centralization for faster decision making; collaboration and sharing across titles; simplification to eliminate all work that doesn’t add value to Time Inc.’s editorial department or client services (“you can always add them back,” she said of cut positions); alignment of goals to reduce costs and grow revenues; and innovation, citing the company’s launch of Maghound and LIFE.com. The prophets of doom and gloom continue to rally their forces to predict the death of print using examples of magazines either shutting down or scaling down their publishing frequency. What those prophets fail to see is that we are witnessing the worst economic crisis in our history. Banks are closing, credit lines are frozen, and investment banks are disappearing… and guess what, the web and the internet are not the reason for that… it is the economy. Why is it so hard for our prophets of doom and gloom to accept the fact that this down cycle in the magazine industry has little, if not nothing, to do with the web or the internet, but rather with the economy and the publishing model that our magazine publisher follow in this country since WWII. The advertising funded model has worked fine for years and years. It is time to change and to start to look at circulation driven models where readers and customers pay the price of the magazine without ad subsidies. The publishing model is broken, and most of the bailout plans that I have seen so far, fail short of a drastic change in the way we do business. If now is not a good time for change, I have no earthly idea when will be a good time. On another front, it never ceases to amaze me that when I report bad news when it comes to new magazine launches, the prophets of doom and gloom directly post my blog on theirs and spread the news. When I reported last month about what a great September it was for new magazines, only one newsletter reported the story. In few days I am going to report on Oct. launches, and guess what, the numbers are up again and they will surprise you in the midst of those dreadful economic times. Don’t count on the prophets of doom and gloom to report those number either. There are still a lot of good news to read and enjoy in our magazine world. 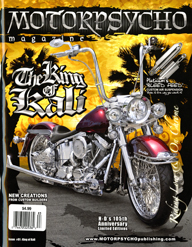 Take a look at the 3rd quarter of the new magazine launches. Relax and take a deep breath. The light at the end of the tunnel is NOT the train coming. The cover of New York magazine sporting the two presidential candidates John McCain and Barack Obama relaxing on a beach and touching hands received a lot of accolades from the media world (including yours truly). 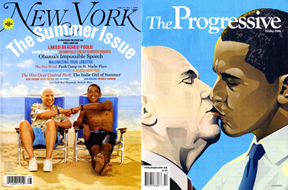 Now, The Progressive magazine takes that relationship one step further and produces a poster-like cover with no type showing the two candidates kissing. The cover begs the question how far is too far? Are the presidential candidates fair game? Part of me, mainly the magazine-person in me, likes the idea of covers that stops you in your tracks, such as The Progressive cover. However, another part of me, the professor-person in me , is bothered with this cover and feels that may seem that it is intended for nothing but the shock and awe effect. However, for a magazine that is ready to celebrate its 100th anniversary, I do not think that the editors or the magazine readers are interested in the “shock and awe” effects, but rather in the magazine content and its take on the issues. The Progressive is published by a 501(c)(3) nonprofit organization and therefore can’t endorse candidates. I don’t know if this cover reflects their attempt not to endorse a candidate directly, but rather through the cover illustration a major endorsement is made without the need for words… Remember the old saying, “A picture is worth a 1,000 words!” Indeed it is. “GOOD is for people who give a damn. 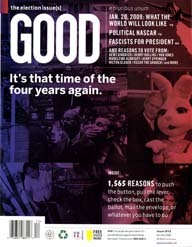 Its an entertaining magazine about things that matter.” That is the tag line that appears on every issue of GOOD magazine since its inception two years ago. Well, I have decided to talk with a person “who gives a damn and knows things that matter about GOOD.” Max Schorr, the 28-year-old C0-Founder, Publisher and now Community Director of GOOD, has seen GOOD grow from a printed magazine to a whole lot more… It is a printed magazine, a website, a weekly GOOD Sheets distributed free at Starbucks Coffee shops, a Mini GOOD magazine distributed via The New York Times, a beta new magazine GOOD Business among other things. The aforementioned communities have one thing in common: showing that people can and should give a damn. Whether it is education, politics, money, food, immigration, health GOOD has been on the forefront of the issues. 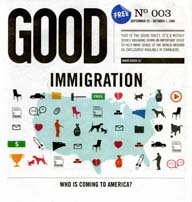 Great content that is complemented by excellent design, GOOD is on a mission to change the world and Max Schorr with his co-founders and buddies of GOOD Ben Goldhirsh and Casey Caplowe is ready to do that. I asked Max what is GOOD? Good is a BIG idea that we became so inspired that we felt like we needed to create a platform for it and the first platform was in print. We now see Good as a collaboration of the people, businesses and non-profits pushing the world forward. We really think there is an exciting cultural moment, kind of what Wired was for technology. We see ourselves filling that role for social engagement. Whether it is an individual or a business looking to align their self-interest with a broader interest, it is just such an exciting moment. A lot is changing, but we think that this idea is really coming to the forefront, so we want to be both entertaining and relevant. We want to be both pragmatic and idealistic. We want to be local, but also global, and we want to be fun and serious and always keep a sense of humor, even when we deal with serious topics. That is a brief overview of Good. What is the mission of Good? What are you trying to accomplish with Good? I think the mission of Good is to move the world forward and to do as much good as possible. Can you briefly tell me a little bit about the genesis of the idea of Good? How did the idea come into being and who was behind the idea? When I was in college and when the other co-founders were in college, I thought that if you look around, you will see that people give a damn. They are hungry for what they can do that is both meaningful, but also can allow them to achieve success. I think there just weren’t that many opportunities to choose from. Are you going to be an investment banker or join the peace corp.? What we really wanted was a way that you could do both at the same time, and we knew a lot of other people felt this way. So, we wanted to create a platform for this. I think simultaneously that the idea of a do-gooder was something that was seen as a pejorative term. It was soft, it was naive, and it was weak. At the same time, we really wanted to make a difference in the people who we really respected and admired. They were making a difference and were doing good, so we thought there is a real perception gap here, and this needs to be re-branded as a moister, energized, clean, fun and serious thing that is not about altruism and getting people to postpone their self-interest, but a way to really align people’s self-interest with a broader interest. That was in 2004, when Ben Goldhirsh (chairman of Good and son of the late Bernard Goldhirsh founder of Inc. and Sail magazines) who was one of my best friends from high school, started a film company called Reason Pictures with the goal to use film to make the world better. The idea was to make films that were both entertaining and relevant. He called his college roommate and me up and said that he thought it would be a good idea to do a magazine called Good that was all about sensibility. We kind of knew what he was talking about; it was an idea that we had all been kicking around for a while. We were in the back room of this little office in Los Angeles and were allowed to just think big and dream what would this platform be. It has been such a thrill to see it come to life and see the idea resonate with other people; all of the amazing contributors and businesses that we have been able to partner with. It has been just a couple of years into it, but it has been an amazing experience. What was the biggest stumbling block you faced during that process? I think the biggest stumbling block that we faced and continue to face is how do you grow print circulation in a cost effective quality way. It is so hard. You see all of the independent titles struggling with this, and I think it is a large reason why there aren’t that many independent titles. Direct mail is obviously the way most magazines do it and have done it, and, with the internet, we thought that there has to be a better way. We looked at how expensive it was and all of our advisers, who were really smart and we really respected, basically said you have to do direct mail. I think it has been a constant challenge to figure out how to grow without really prioritizing direct mail. 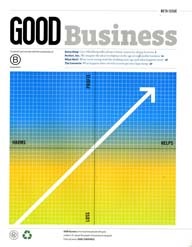 We came up with the Choose Good campaign, which has been really successful and has built us an incredible community of people and done so in a cost effective way while generating money for non-profits, but the challenge has been scale, so right now we are at a 75,000 rate base, and we are doing quite well on the newsstand. We are selling about 30,000 copies an issue, which is about a 45 % sell-through rate, which is all wonderful, but still we face that ongoing challenge of how do we scale this in a cost effective way. Can you tell me more about the genesis of the Choose Good campaign? 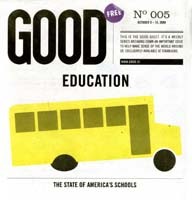 The genesis of the Choose Good campaign (in which all the proceeds of the magazine subscriptions go to non-profit organizations of the subscriber’s choice) was that we were working with some advisers helping us figure out how to make this magazine work. Circulation was the key and direct mail was their solution and, basically, the only way to go. We outlined an acquisition cost of about $45.00 per subscriber, and, at the same time, we said we are doing six issues a year, so the most we could charge was $20.00. We were stuck. We didn’t even think that direct mail was going to get the young-minded readers that we wanted to reach, because we knew that we don’t respond to direct mail. We were thinking that it is really expensive, and we aren’t even sure if it is going to work in the way that we need it to work, so how could we use that $20.00 in a different way? It just came to us that all of these amazing non-profits inspired us, and it just came up as a crazy idea and everyone liked it, so we went live with it. I think it really helped convey this idea to people. What do you think was the most pleasurable surprise that faced you through this process? There are several things that have stunned me. One is when the physical issue was out there and you could see it. 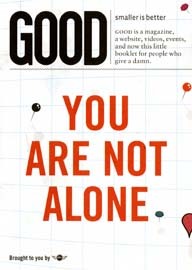 I was at a coffee shop the other day, and this really cool looking person was reading a copy of GOOD; It always stuns me to see a normal person reading it. Just seeing the process of it going from an idea to actually being a real thing in the world was a really moving thing for me. Going into these incredible institutions and being treated with respect and having so many wonderful organizations want to partner with us has been an incredible experience. I think that all of that has been encouraging and really exciting. Are you now more into a community business? Tell me more about the Good community. I think that is the key. We really think of GOOD as an idea and as a collaboration. The print form has been really amazing. We love it, and we love what we can do whether it is the magazine or print extension in The New York Times, but I think we are really excited about how we can best use this idea to connect businesses and individuals and move the world forward. I am taking on more of a role and thinking in a broader sense how that applies to print, online and in personal experiences. Do you think that is the future of publishing? Yeah. I am not one to necessarily predict the future, but I think that integrated media is a good thing. We are learning. 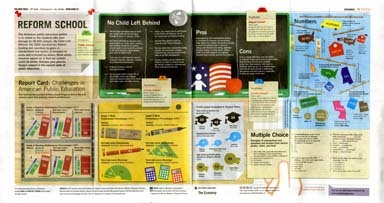 What is behind the idea of presenting information using info-graphics and charts? That has been a really fun section in the magazine. Casey Caplowe, who is a co-founder and our creative director, has done an amazing job at coming up with this transparency stuff and design. Also, our Design Director Scott Stowell has done such incredible work for us. He is such a pleasure to work with. The two of them took this idea of how we can convey information in a really powerful way, and they go out to different design firms each time. The results have been really fun. I think we live in an information age, but there is still so much noise, and I think it is fun to take a relevant piece of information and present it in a dynamic way. I guess that is the challenge each time. What makes you tick in the morning? I think this has been my dream job. It has been such a wonderful opportunity to create something you believe in and work with such incredible people. I think this idea is something we believe in, and it is really, really hard to make this happen so if you stir that up, it gets me fired up in the morning. I think that and the combination that a lot of things are wrong right now and a lot of things aren’t going well — whether it is the economy, the war or the environment — there is a lot of stuff that isn’t going right, and, at the same time, there has never been more opportunity. Also there is so much talent. It is the challenge of the generation to try to do something about it. Do you think that the magazine business in general is in trouble? Do you think we need a bailout? I think it is going to be a period of creative destruction, and I think that innovation has to happen. I think print will always be useful for what it is, but the question is how to make that work as a business; and that is going to change. I think there is also the question of how do you reach young people through print. I think that is an ongoing question. I don’t have a bailout plan right now. What is your view or your vision of the future for magazine publishing? Do you see GOOD in print five years from now or ten years from now? I see us definitely doing print initiatives for a long, long, long time to come. The question is how. We want to work with our audience, advertisers and work internally to figure out the best ways to do that. I think it is exciting that a lot of the answers are still unknown. How about the GOOD Sheets. Is it going to continue or is it just the election? This is an eleven-week program, so after the election we are going to regroup and talk about how this went, and we hope to do more stuff like that in the future. What advice would you give people younger than you who are in journalism schools now? Should they stay in journalism? What should they know to be prepared to be where you are now? Can you find a way to do what you love more than anything else? Is this what you love to do? I think if you do that then it is going to work out. If they actually wanted to start a magazine then go to a local paper. If they are on the editorial side, then do the best editorial work in the world. There will always be a space for the best content creators. If they want to create their own magazine, I think it would be foolish to not look online before you look in print. You can do print in a really local, simple way and scale it up, but I would try to be profitable as soon as possible. If we were to do it again, I would have more energy going online before throwing so much energy in print. I just think the joy in life is doing what you love to do. Journalism is so needed right now. Reader-generated content is becoming something of the present. Before the web (BTW) magazines like Country and Taste of Home depended on the postal service to deliver bags of mail to create the reader- generated content that was the corner stone of the Reiman Publications’ empire before selling it to Reader’s Digest Association. After the web (ATW) JPG magazine and its publishing company 8020 pioneered the use of the internet to create printed reader-generated content magazines. Budget Travel magazine and This Old House both created magazines written completely by readers. In fact This Old House altered the name of the magazine to Your Old House to reflect the nature of the content. Now in this ATW age, comes Greece magazine from the United Kingdom. 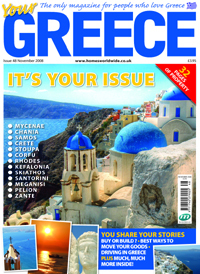 Merricks Media’s John Weir tells me that the November issue of Greece magazine will be their first reader-generated issue and they too altered the name of the magazine from Greece to Your Greece. I asked John about this ATW experiment with Greece magazine and the input he received from the readers. Will he do it again? “We’ll definitely do it again – already we’ve seen a 30% rise in subscription applications and the emails have started coming asking when the next issue containing reader content will be put together,” he said. The success of Rolling Stone is totally embodied with that last paragraph from Wenner’s Editor’s Note. Not too many magazines can claim that they have been true to their DNA, soul and mission through the years. Even when the magazine deviated from its original mission and soul, ever so briefly, Jann Wenner was able to navigate the ship back to its course. A job well done. This issue is a keeper whether you paid $4.50 on the newsstands or a mere 33 cents by subscription. A great example of how change can be executed without messing up with the DNA and soul of your publication. Whoever coined the phrase “size does not matter” was absolutely right when in comes to the new standard size of Rolling Stone. The only thing that matters now is that the magazine feels, forget about feels, it actually has, more pages and more “good” stuff that I can only hope that I will have the time to read every other week. To quote Graydon Carter editor of Vanity Fair at last week’s TimeWarner Summit Politics 2008, “We carve out our ground and try to tell great stories and have great pictures, which is something you can’t get on the internet.” I know he was not talking about Rolling Stone, but about his magazine Vanity Fair, yet I feel what he said is even more applicable to Rolling Stone. Thank you Jann Wenner for the change in Rolling Stone that we can believe in. 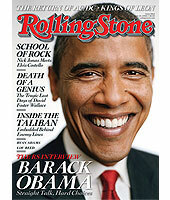 Click here to read more about Rolling Stone and good journalism. I am sure that we all need a touch of bloom in the midst of all the doom and gloom economic climate we are witnessing these days. So, without further due, here is some good news. The number of new magazine launches for the third quarter of 2008 exceeded that of the similar period of 2007 by 29 magazines. For the first time this year, the new magazine launches reversed the huge downturn trend that started with the third quarter of 2007 and continued throughout the first half of 2008. Read the first half report here. Motorpsycho, LA and Beach Blvd. Bride are but three out of the 155 new titles that were launched in the third quarter of 08 compared with 126 in the same period of 07. There were at least 462 new titles launched so far this year compared to 480 in the same period of 07, thus closing the wide gap between 07 and 08 to a mere 22 titles less this year. However, if the fourth quarter continues to reflect the third quarter numbers, we are on the road to witness more magazine launches this year than the year before. And for the prophets of doom and gloom, here is more good news from the third quarter of 2008. A total of 51 magazines were launched with a frequency of four times or more in the third quarter compared with 43 last year. An increase of 8 new titles. It never fails to remind folks all the time not to write-off the launches of new magazines from the media landscape. Every new magazine published is a new media by itself. Check all the titles published throughout this year here and be your own judge on how healthy our magazine industry is. It Is Not The Picture, Stupid! Much has been said about the picture of Sarah Palin on the cover of this week’s issue of Newsweek. I was interviewed yesterday by Joe Mathieu’s Press Pool program on XM Satellite Radio’s political channel about this issue, which by the way, is all over the media channels. I told Joe that the funny thing about our business is that we are “damned if we retouch a picture, and we are damned if we don’t.” You all recall the trouble TIME magazine got into when they retouched O J Simpson’s picture for their cover back in the mid 90s. Yes, it is a fact that we use Photoshop and retouching on a lot of pictures in fashion magazines, men’s magazines, teen magazines, etc., but when it comes to news magazines that is when I draw the line. If we retouch or alter a picture, we owe it to our readers to tell them that this is a photo illustration. Well, back to the issue at hand. 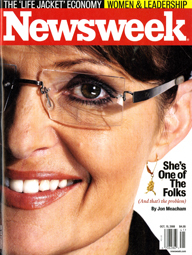 I do not believe that there is anything wrong with Sarah Palin’s picture on the cover of Newsweek. It is in line with some other covers that Newsweek has been producing lately using tight cropping of the images on the cover. 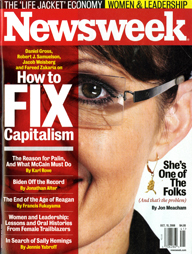 However, two things most media pundits have ignored and not commented on: The first is that the newsstand edition of Newsweek had an additional cover flap that covered half of Sarah Palin’s face and focused the attention more on How to Fix Capitalism, thus reducing the IN YOUR FACE impact of the cover image. The second issue, and this in fact is the main one, is the cover line and the byline on the cover. The cover lines present a statement (She’s One of The Folks) and a response to the statement (And that’s the problem) and the byline is that of Newsweek’s editor Jon Meacham. In the newspaper world they call that an editorial and not a cover story or an article. What happened to the days where columnists used to editorialize and editors used to present a fair and balanced (in other words, non-biased views) of things to their readers? I know we all have our biases, but the so-called newsweeklies have always separated between the news articles and the opinions, until today… and that, my friends is the main problem. It is not the picture stupid, it is the content that is the main problem. 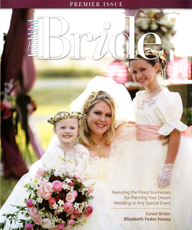 You are currently browsing the Mr. Magazine blog archives for October, 2008.